Some months ago, I found a 1977 book published by the National Geographic Society: Journey Across Russia: The Soviet Union Today. A writer (Bart McDowell) and a photographer (Dean Conger) covered 30,000 miles, visited 50 cities and towns, and the 15 constituent republics of the U.S.S.R. It’s an admirable effort that avoids ideological propaganda, even with the restrictions placed upon them. Moscow today is a city of power and platitudes. Billboards exhort the public not to acquire but to act (“KEEP HIGHER THE BANNER OF PROLETARIAN INTERNATIONALISM”). Sidewalks bulk with crowds, and everyone seems to carry a string bag, called a “just-in-case,” for the impromptu, windfall purchase. The string bags and billboards have disappeared (though propaganda proclaiming Crimea to be Russian has replaced the proletarian internationalism of the 1970s), but Moscow remains the center of power and bulges with people. Moscow’s metro is sublime. It’s a work of art in and of itself. 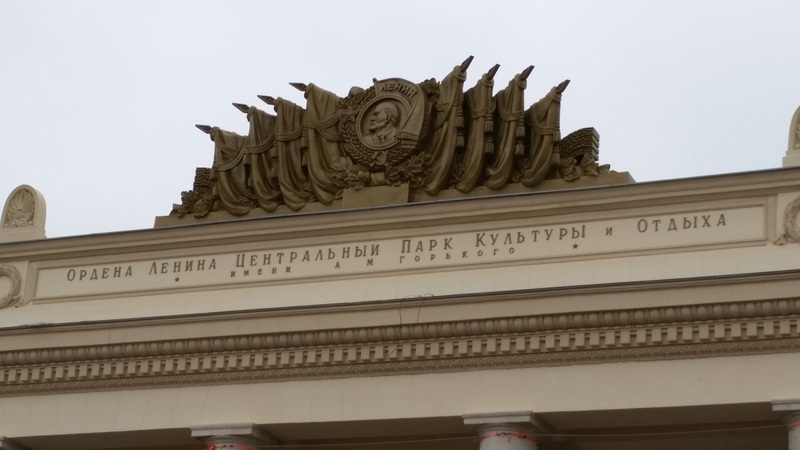 Communist mosaics, statues of Lenin, the proletariat workers, and soldiers, and other Soviet motifs adorn the stations. Occasionally, music plays from speakers along the escalators. Spoken English is limited, more so than most places I’ve visited in eastern Europe. Some neighborhoods look Viennese, and others look like nothing has changed since the 1950s. The Old Town Square in Prague is the only place that rivals Red Square. Finding a restaurant feels like a chore, no matter the part of the city. It’s always overcast. Russians don’t fear to show affection in public. Women carrying a flower or a bouquet are common. Street kebabs are unhealthy if not life-threatening, or so it has been explained to me after I told my horrified friends I ate one. So maybe skip on those and find a Soviet-style canteen, called a stolovaya. The women are as fashionable in Moscow as in Stockholm. Like in Sarajevo and Sofia, I think it’s a sort of conspicuous consumption. With the fall in oil prices and Western sanctions, the recession made bars and social spaces much less crowded. The decline of the ruble (hovering between 60 and 62 to the dollar when I was there in March, compared to 35 a year ago) had Moscow about about as expensive as a small city in the Midwest for dining out. The police presence is noticeable. (That held true almost everywhere I went). Russians are patient with non-Russian speakers, though they’re surprised that non-Russian speakers are in Russia. Moscow swivels among majestic, drab, eclectic, weird, and Soviet. Lenin and Engels statues outnumber Pushkin sightings, but barely. . The sickle and hammer were everywhere. Perspectives on the USSR are complicated, and the American myth of the fall of communism and triumph during the Cold War makes that hard to understand. It isn’t a clean break like the Germans had with the Nazis. For the repression, deportations, purges, murders, and depravity committed in the name of the Soviet Union, life continued, and not all was fear and dread. Russian pride is also stubborn, and, like American pride, will overlook the bad and indefensible. 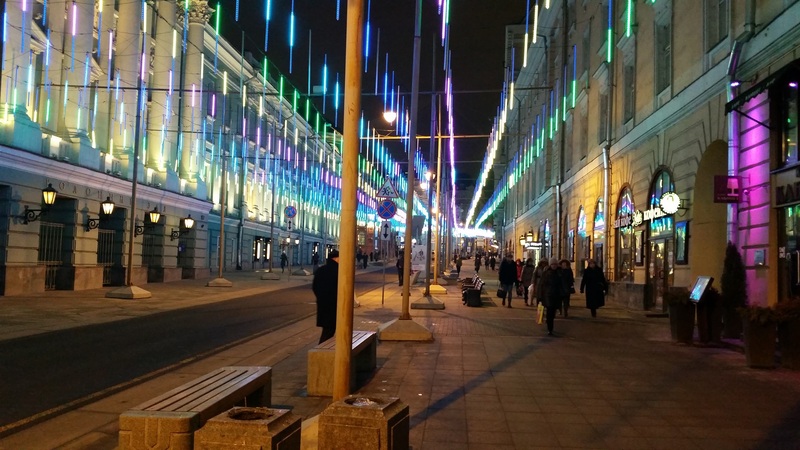 In the evenings, Bolshaya Dmitrovka lit up. Bright Eyes is playing in a Starbucks. Moscow can feel insular, but strange bits of American culture seep in. For as boorish and uneducated as American media paint Russia, respect and enthusiasm for the arts is almost unparalleled. Couples at art museums outnumber the schoolchildren. On the metro, I saw more readers (print and digital) than any other metro I’ve taken. Throughout my trip, the Russians I met revered Pushkin, Dostoevsky, Brodsky, and Chekhov, and would ask which Russians I’ve read. The sparse souvenir shops were unexpected. Soviet kitsch is limited to fur hats with a red emblem on the front. To find one, ask the tourists wearing them in front of the Kremlin, St. Basil’s Cathedral, and Lenin’s mausoleum. Soviet pins (commemorative and military) get sold at flea markets and street corners. For as difficult as it is in Russia, pride survives. Sometimes, it’s arrogance, but it manifests in a certain self-assurance; Russia can be self-fulfilling in culture and history if need be. Whatever happens, Russia will continue. It is resilient and eternal. That drives a passion that pushes its culture and intellectual achievements to chase a certain transcendence, but also enables something dark.